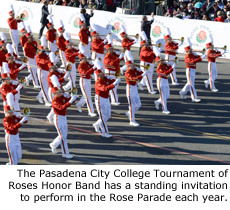 PASADENA, Calif. (Oct. 20, 2015)  The lineup of marching units for the 2017 Pasadena Tournament of Roses Parade is starting to become clear, with news reports and social media posts emerging as groups reveal they have received a coveted invitation to the spectacular New Year's Day event. Invitations are currently being extended for the 128th Rose Parade to be held Monday, January 2, 2017. Although the Tournament of Roses is still focused on the upcoming 2016 parade  taking place Friday, January 1, 2016  the music committee typically extends invitations at least 15 months in advance to give marching bands enough time to raise funds and prepare for the big trip. The Foothill High School Marching Band from Henderson, Nevada will be making its first appearance in the Rose Parade. Director Travis Pardee said he felt "excitement, elation and honor" when he received a call from the Tournament of Roses committee informing him of the band's selection. Pardee shared the news with band members during a special assembly in mid-September, when he played a video message from 2017 Tournament of Roses President Brad Ratliff. The joyful reaction from Foothill students is captured on a YouTube video which can be viewed below. "We are looking forward to performing in America's New Year's Celebration!" Pardee said. Another first-time participant will be the Ooltewah High School Marching Band from Ooltewah, Tennessee. Director Joel L. Denton said the band originally applied to perform in the 2016 parade, but narrowly missed getting an invitation for that year. "The band was a finalist [in the 2016 selection process]," Denton said. "I was asked if I wanted to carry our application over to 2017. Of course I was honored for our band to be considered. I still had to submit a 2017 application, but was able to use our video and recommendation letters from the 2016 application." "All the people connected to the parade have been genuine and incredibly helpful to work with," Denton added. "Our entire program is honored to be included with these outstanding bands." More marching units are expected to be announced soon, including a selection that will be revealed during the Bands of America Grand National Championships on November 14. 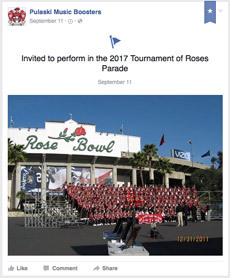 For ongoing updates, check the Pasadena Tournament of Roses featured event profile on Marching.com and follow Marching.com on Facebook. Looking ahead ... the deadline for bands to apply to the 2018 Rose Parade is May 31, 2016.